Sun, Feb 3, 2019, 01:04 pm SL Time, ColomboPage News Desk, Sri Lanka. Feb 03, Colombo: The parties in power should not neglect the responsibility of producing graduates with vocational skills to match the local and foreign job market requirements in the local university system, the President said. The President said the plans and policies of the education system must change in order to match the job market and the universities should cater to the demands of the job market. He made these observations participating at a ceremony held at the BMICH yesterday to launch a book written by former deputy minister Dr. Mohan Lal Grero on the Sri Lanka's education system not fulfilling the job market needs. 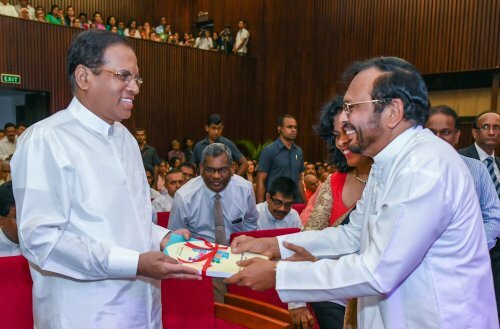 President Sirisena further said that the voice for making reformations in the system of education that suits the job market has been raised in the country in the past. It was a long term request and many research reports were released on that issue. However it was not properly answered and that it is sad to see that none of those who speak on behalf of their own union rights had not considered this matter. Dr. Grero launched the research thesis of his doctorate on the science of education titled "Sri Lankan education system and the mismatch of the job market" as a book. The first copy of the book was presented to the President by Dr. Mohan Lal Grero. Speaker Karu Jayasuriya, Thilanga Sumathipala, Prof. J.B. Dissanayake, Prof. Mohan De Silva and other distinguished guests were presented at the event.